This is one inspiring country with an enormous range of environments. Its an easy place to travel around and an excellent country to make some great memories in. Lanzarote is a wonderful island, filled with volcanic wonder. It has a variety of landscapes and this image captures the dramatic volcanic scenery that co-exists alongside the traditional tourist towns. There are magnificent drives to be had on this island, from the busy beaches up to the peaks in the National Park. Click here for more information. Spain houses many impressive places of worship, many ancient wonders. All religions are represented in this country but Catholicism remains the most popular religion. Ourense Cathedral reflects the amazing architecture that is easily found in mainland Spain. This beautifully crafted structure was built in the 12th century and provides an interesting visit when in the region. The traditional dance of Spain is the Flamenco. It is a passionate climate of a dance – building up slowly to a frenzied crescendo. It has the viewer in awe of the intricate steps that both the males and females have to perform. This art form is highly revered throughout Spain, it has been the traditional music and dance of Spain, although it was initially from the Andalucian region. The “guardians of Flamenco” are seen as the gypsies of Spain and the traditions of the dance are passed down to each generation. Traditionally, Spaniards eat very well. The focus is on fresh produce and fabulous flavours. Nothing personifies this better than paella, the rice and fish dish that is eaten all over Spain. 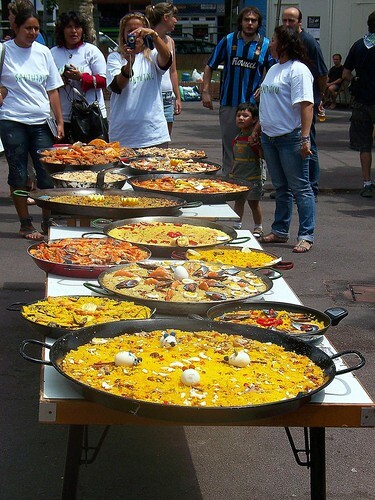 Legend has it that paella originated in the fields and labourers cooked their lunch on a big fire. Everything they had was thrown into the pot and this dish evolved. There are variations in every region but the basics of rice, chicken and seafood remains the key ingredient to this superb dish. One reason for visiting pain is for its awesome beaches. They are stunning and plentiful.